Today I’ve got another Pretty and Polished polish for you! This one is called Sugar in a Sundress. It’s a pale yellow with medium blue and dark cobalt blue glitter. I honestly didn’t think I’d like this as much as I do. I absolutely love the glitter colors, and the yellow is really nice and delicate and doesn’t clash with my skin tone. I was planning on layering this one, but I ended up really liking how it looked with just two coats on its own. The formula was really nice, but it did pull a bit at the cuticle, so just make sure your first coat is dry before you go for a second. If you’re looking to layer, I think Color Club Macaroon Swoon would be the perfect base color. It doesn’t look like this one is currently available (sorry! 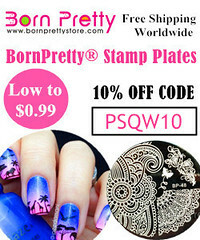 ), but you can buy Pretty and Polished on their website or Etsy shop. I’ve mentioned before that Pretty and Polished was one of my very first indie polishes back when I started blogging (check out my first P&P post from three years ago – Valentino – here!). If you haven’t tried this brand yet, I’d definitely recommend it! It’s been a while since I’ve bought or swatched an indie polish. But I couldn’t resist Pretty & Polished’s 50% off Daylight Savings sale a few weeks ago. I got my first ever color changing polishes, a couple glitters, and this gem. Popples is a white jelly with pink, blue, and green neon glitter. I actually don’t own anything like this, and I really love it! It probably would have taken about three coats to be fully opaque, but I did two over a coat of OPI Angel with a Lead Foot. I have this thing about conserving “special” polish, so I usually use them with undies. Pretty & Polished polishes (including Popples) can be purchased here. Pretty & Polished is just one of those brands that is consistently good quality and is coming out with different things all the time. I’ve been a fan since I purchased Valentino (probably discontinued) back in 2012. Let me know what you think in the comments below! Last week, I showed you A Study in Polish’s Consulting Detective, which is the Sherlock Holmes polish in her Sherlock collection. Today I have the polish inspired by John Watson, Army Doctor. Army Doctor is a grass green with copper glitter and a pretty blue shimmer. Normally, I don’t like glitter in shimmery bases, but I think this one is done really well. The formula is pretty great, too – this was two smooth coats. You do have to be a bit careful with this to avoid pulling, or just do three thin coats instead. A Study in Polish is available here. I bought a bunch of them a few weeks ago, and I haven’t tried a single one that I don’t love. You should definitely check her out! P.S. Any Sherlock fans out there – what did you think about the season 3 ending? I can’t wait for season 4! Today I have another awesome indie polish. I’ve kind of been ignoring my indies lately, but I’ve been determined to give them some love, since I have a ton of them I’ve never worn. You might already know that Lac Attack released another Harry Potter themed collaboration collection with Glitta Gloves. And if you’ve been reading this blog for a while, you probably already know that I bought it (ok, fine, I preordered the entire collection the second it was available); I have a serious weakness for polish named after my favorite things (even if I don’t actually like the color). Luckily, I’m kind of in love with Lac Attack – her polishes are so amazing she actually makes me like things I usually don’t, like bar glitter. This is Padfoot from the Magical Mischief collection and it is gorgeous! Padfoot is a warm brown holographic polish. I don’t typically like brown, but this is really pretty! It ended up being one of my favorites of the collection. The formula was awesome – super smooth and opaque in two coats. For those of you who don’t know, Padfoot is Sirius Black’s nickname. Although I guess if you didn’t know that, you don’t know who Sirius Black is so go read/watch some Harry Potter. Because if you haven’t, you are really missing out. You can get Padfoot and the rest of the Magical Mischief collection here! Also check out the first Lac Attack/Glitta Gloves Harry Potter collection, Magical Musings. There really is something for everyone in there: jellies, holos, glow in the dark, and tons of glitter! I’m a few months late for Star Wars Day, but I recently purchased three polishes from Rainbow Polish’s awesome Star Wars collection, so I thought I’d do a big post with all three! Yo-Duh! is a green-tinted jelly with large pale green glitter, tiny black glitter, and bright green squares. The green color in the base is barely there, which I actually like, because you could probably make this work over almost any color. Plus, it’s not streaky, so it’s easy to layer over contrasting colors, which doesn’t often work well with polishes like this. I do have to say that the base was kind of watery, but not too bad. Surprisingly, the green squares were the hardest to get out of the bottle. This is two coats of Yo-Duh! over OPI Jade is the New Black. I did have to dab a little glitter into some bald spots to even it out. I think this would look awesome over black! Next up is my favorite: Trooper (as in Storm Trooper). Everyone loves black and white glitter, right? I have a reasonable collection of them myself. And so far, Trooper might just be my favorite. I love the ratio of black to white: tons of white (in different shapes and sizes) with just a touch of black. But I really love the tiny iridescent flakes! They really had something special. I wish I had a bottle of just baby flakies that I can wear with everything! Shown is one coat of Trooper over Essie Butler, Please? And finally, we have B-Fett (named after Boba Fett). I really love this one, too! It’s a very interesting combination of colors, and very reminiscent of Boba Fett’s uniform. B-Fett is a sheer gray base (a little thicker and more pigmented than Yo-Duh!) with teal, light blue, white, and yellow glitters. I really love the effect the colors have all together – it reminds me of a rainy day. P.S. Can I just say how much I love sheer matte glitter? So pretty! This was two coats of B-Fett over Sephora by OPI Frankly, I Don’t Give A-dam. Again, I had to place some of the glitter to even it out. I picked my favorites, but there are eight polishes total in the Rainbow Polish Star Wars Collection. I might pick up a few more (probably Artoo), but I am very happy with my picks! You can purchase these and more in Rainbow Polish’s Etsy shop! Yes, I bought this one for the name. I have a problem, ok? At least I like this one. And yes, I have bought ugly polishes that may or may not have awful formulas just because I liked the name and/or had (yes, had) to complete the collection (cough – OPI Who the Shrek Are You? – cough). But Vel-awesome Raptor is actually pretty “awesome. Vel-awesome Raptor is from an indie brand called Two Birds (their Etsy shop is called Two Birds, One Store – how cute is that?). And it is a glitter topcoat – though you might be able to get it opaque eventually – made up of matte neon green and black micro glitter. I layered it over OPI My Boyfriend Scales Walls. From a distance, it pretty much just looks like pale neon green polish with black flecks, but I kind of love the effect! The green glitter is a bit sheer, so it’s hard to see over darker colors. You can purchase Two Birds nail polishes from their Etsy store. I’m (not so) patiently waiting for a restock of Sandcastles in the Sand – I love a good neutral holo!